Los Angeles Dodgers rookie sensation Yasiel Puig was named the National League Player of the Week on Monday after a phenomenal first week in the big leagues. In his first seven games this season, Puig has batted .464 (13-for-28) with four home runs and 10 RBI along with a strong OBP/SLG/OPS line of .483/.964/1.447. 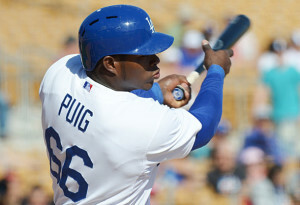 After receiving his big league call-up from Double-A Chattanooga last Monday, Puig has taken the baseball world by storm, becoming the first Dodger since 1900 to register 13 hits in his first seven games in the major leagues. Puig is also the first rookie to receive the Player of the Week honor since Baltimore Orioles third baseman Manny Machado in August 2012. Puig has hit safely in six of his seven games this season, highlighted by his second career game in which he went 3-for-4 with two home runs and five RBI. Puig has not only lit up the batter’s box, but has also impressed with his defensive ability, registering two impressive outfield assists that have showcased his canon of an arm. Dodgers manager Don Mattingly announced that Puig will be batting cleanup for the Dodgers in Monday night’s contest against the Arizona Diamondbacks, as Nick Punto will bat in the lead-off spot, replacing an injured Hanley Ramirez at shortstop.